At least two people were killed and two others injured in a crash in Northland. Residents near the scene on State Highway 10 reported hearing a loud bang as the two cars collided. Emergency services were called to the accident, at the junction of Puketona Rd in Oromahoe, Far North about 7.30pm. Karen Lyman of the Bay of Islands Country Lodge said a truck driver staying with her had witnessed the accident just after it happened. “He looked up just after the two cars collided head on,” she said. A woman was killed in a two-vehicle crash in Upper Hutt earlier this evening. The collision occurred on the corner of SH2 and Whakatiki Street at 6.15pm. “A woman was critically (!) injured after a Hobbiton tour bus and two cars crashed near Matamata. Several others were also injured, including bus passengers, in the crash at 1pm on Saturday. “Four people from the cars were injured. One, a woman in her 50s, is in critical condition in Waikato Hospital. Several people on the bus suffered minor to moderate injuries, a Waikato Westpac Rescue Helicopter spokesman said”. More reasons why you should bring your family to Godzone!! A person was killed and another critically injured after yet another helicopter crash just east of Lindis Pass in Central Otago today. For a comprehensive listing of helicopter and plane crashes in NZ, or those involving Kiwi pilots, search blog content. Between 2001 and 2014, New Zealand’s vehicle fleet reportedly increased by 32 per cent, while the population grew by 16 per cent and foreign travel was up by 15 per cent. “We know the number of crashes involving overseas licence holders — less than 6 per cent of all fatal and injury crashes — has stayed relatively constant over the last 10 years when the number of international visitors has increased by about 30 per cent”. 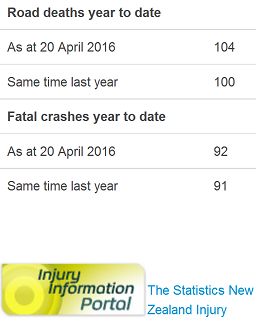 Fatal crashes: Only one report allowed today! 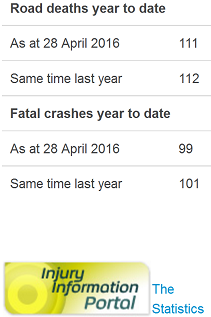 To keep the fatality figures in line with last year’s, they’ll have to manipulate them on a daily/weekly basis. Based even on the government’s heavily manipulated data, an average of 25 crashes occur on NZ roads each day, resulting in 31 reportable injuries including 14 hospitalizations (8 serious injuries) and at least one fatality. 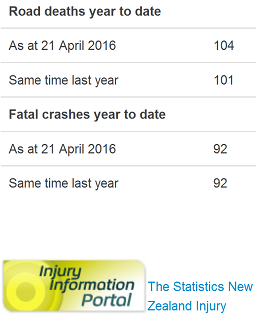 That is 700 crashes in last four weeks (since April 2), resulting in 868 reportable injuries including 392 hospitalizations (224 serious injuries), and at least 28 fatalities. However, no more than about three dozen so serious crashes have been reported over this period. What happened to the other 660 or so crashes that have occurred over the past 4 weeks??? 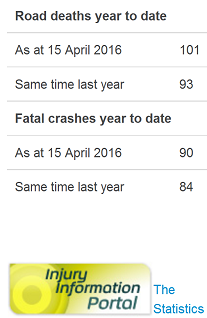 There’s clearly a reporting ban [also] on serious crashes in effect. If all of the serious crashes were to be reported, police would be unable to manipulate the road toll. White Island, the volcanic island off the coast of the Bay of Plenty, erupted last night between 9.30pm and 11pm, GNS Science said. Volcanic Alert Level has since been raised to Level 3 (Minor Volcanic Eruption) and the Aviation Colour Code to Orange. GNS have recorded a 2-meter fall in the water level of the crater lake in the last 2 weeks. The lake temperature has increased 2C, from 56C to 58C, since February. SO2 output has ranged between 90 and 480 tonnes per day over the last 5 weeks. The body of Auckland man Gregory Paul Reynolds, 47, has been found in the dense bush in Tonga, near the resort where he was staying, Radio NZ reported. 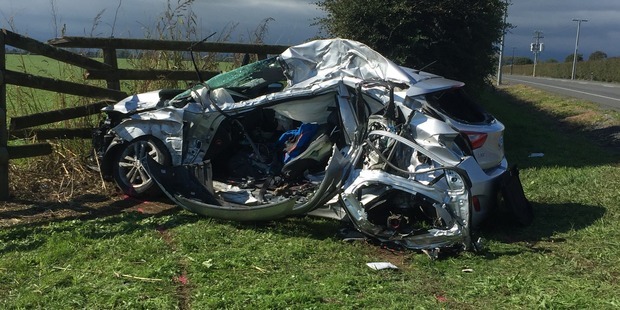 The driver of a car was killed in yet another horror crash on State Highway 27 at Te Puninga, between Morrinsville and Tahuna today. 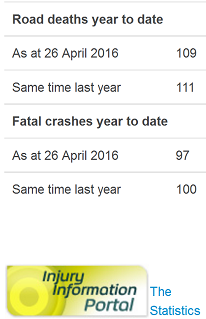 Waikato region’s official road toll now stands at 24 from 18 crashes so far this year. 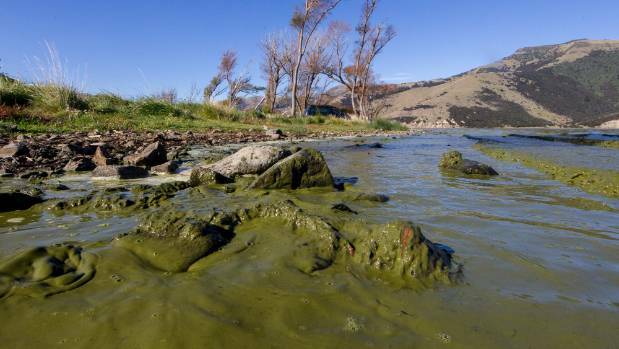 Poisonous water in Canterbury’s Lake Forsyth lake has killed dozens of sheep and household pets, due to recurring algal blooms which have made the water toxic. Signs warn that the water is dangerous for humans and animals. However, most animals ignore the signs. At least 18 possible cases of measles, including eight confirmed incidences, have been reported to Waikato District Health Board (DHB). Transport Minister Bimon Sridges has confirmed $278 million upgrade to the ill-fated stretch between Pokeno and the State Highway 25 intersection. Over the past five years, at least 18 crashes leading to 34 fatalities and scores of serious injuries have occurred on the road, the majority of which have been a result of either head-on collisions or vehicles veering off the road, according to a report. Construction is expected to get underway in 2017/18 [or at the latest by 2019/2020 and it should not take more than a dozen years or so to complete]. Hamilton crash victim was ‘a happy-go-lucky guy’ except today! Kyle Sutherland, 26, never made it to work on Wednesday morning. “Instead he was found dead in the driver’s seat of a submerged car wreck”. This victim, unavoidably, made it to the official road toll! … but you have a two in three chance of not making the list. Why are [number of users not backed by evidence. Moderator N.] in ten Kiwis addicted to crystal meth? Police still do not know the identity of a man whose body was found dumped by a remote Canterbury road. A group of Filipino fishermen found the victim’s body in Drain Rd, Doyleston, about 40 kilometres south of Christchurch, on Monday. Derek Bunting, 60, died on the Paekakariki Escarpment Track (Te Araroa Trail), also known as the “Stairway to Heaven” on Monday evening. Monday’s death is understood to be the second reported fatality on the Te Araroa Trail since it opened in 2011. Two more French tourists will be leaving New Zealand with sickening memories after they were the victims of a violent robbery. An Auckland investor has bought a three-bedroom rental in Kelburn for $1.4m – $500,000 over its rateable value. The government can easily put a stop to this racket, but they enjoy seeing the rich screwing everyone else. IT’S OK TO JOIN THE AIR FORCE [in a support role] SO LONG AS YOU ARE NOT THE ONE DROPPING THE BOMBS???? Spin facts, deny conspiracy, spin conspiracy, deny facts… boobytrap facts, double-spin conspiracy… confused? Well, at least you’ll get the idea! Muktar Mahmud, 31, a “black” taxi driver killed in Melbourne as he walked home earlier this week was a Somalian refugee who had been living in New Zealand. He was found injured in the suburb of Fitzroy shortly after 11.30pm on Wednesday. His mother and brothers still lived in Wellington but he moved to Australia, where his father lived, to work. “He was one of the good guys, cool, friendly, level headed, a good son and friend to so many people… no one can believe this happened to someone like him at all,” said a family friend in a Facebook eulogy. A 2-year-old boy, originally from Afghanistan, was choked to death while eating his meal about 4.30pm on Wednesday. A Givealittle page has been set up to help bring a Whanganui-born teen from Western Australia to New Zealand for burial after she was killed in a car crash east of Perth on Tuesday. Hine Aro Kumeroa-Green, 18, was killed when the car she was a passenger in lost control the Great Eastern Highway near Carrabin. The 25-year-old male driver was flown to Royal Perth Hospital with serious injuries, according to a report. A driver was after their car crashed into a truck carrying milk cartons in Te Atatu, Auckland at 5am on Saturday. Yet another motorcyclist is said to be in a critical (!) condition after colliding with a car on State Highway One in Northland. A second motorcyclist who also collided with the southbound car at Three Bridges, north of Kawakawa, is said to be in a serious (!) condition. Pita Tekira, 29, allegedly the man who killed a police dog before barricading himself in a house on Kokiri Cres, Porirua, north of Wellington, has allegedly shot himself during police siege. He had “put some effort into barricading himself into an upper level of the house”, police Kommandant for Wellington District said. “We’d gone through a long process as part of. Eventually we knew had to enter and confirm what had happened at the address”. Police insist they fired no shots and all those who heard multiple shots being fired were most definitely mistaken!! Car mechanic Jeremy Burrell has been put on home detention for issuing illegal warrants of fitness. He issued the warrants using documents from his employer and entered them into the NZ Transport Agency website. He was sentenced to four months home detention and 150 hours community work in the Christchurch District Court on Friday. Blog moderators tell Judge Allan [F**K-UP] Roberts that his sentencing is undermining “a system that was meant to ensure” public safety by keeping the criminals locked up. Foreword: So much for refugee families being safe in New Zealand! Mon Chhetri, 37, and her 8-month-old son, Aron Chhetri, were killed in a serious crash. Her husband Tula Ram and one of their daughters, Jessica, were seriously injured near Twizel in South Canterbury, on Tuesday. 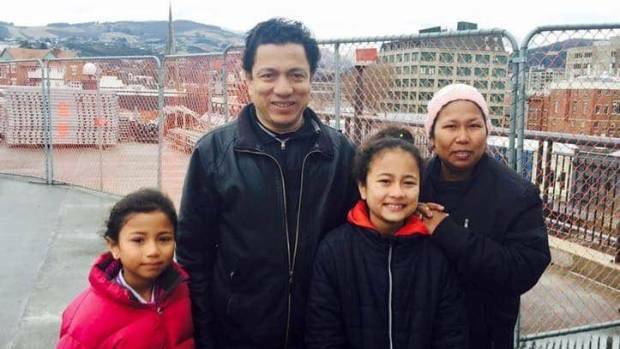 Tula Ram and his wife Mon Chhetri with two of their daughters, Jessica, 8, left, and Bidhya, 10. The crash killed Mon and the couple’s 8-month-old baby, Aron. Tula and Jessica were seriously injured. Bidhya was not in the car. Photo supplied/ via Stuff NZ. Mother of two Arahia Rarere-Mischefski, 27, died from butane abuse, a coroner has ruled. Raw sewage reportedly flooded cells and common areas at Auckland’s Paremoremo prison [again] today. “This is the third time this has happened. Most institutions have audible sewage overflow alarms, but as we know, Corrections don’t mind placing inmates health at risk.” said an unidentified source. Mr Sherlock, Auckland Prison director, confirmed the spillage had occurred on Sunday night. More than 3,400 overseas visitors, international students, foreign workers, refugees and recent emigrants have lost their lives and about 18,000 others seriously injured in New Zealand since year 2000. How Many Tourists Killed in New Zealand? More than 3,400 overseas visitors, international students, foreign workers and recent emigrants have had their lives cut short and about 18,000 others seriously injured in New Zealand since year 2000. A tourist who was violently killed after the rental she was a passenger in collided with a fully laden logging truck near Matamata was an American woman, travelling with her parents, police said. The 22-year-old woman was instantly killed in the crash on Hopkins Rd, off State Highway 29 on Monday morning. The woman’s 59-year-old father was driving the car while her 55-year-old mother was in the back seat. 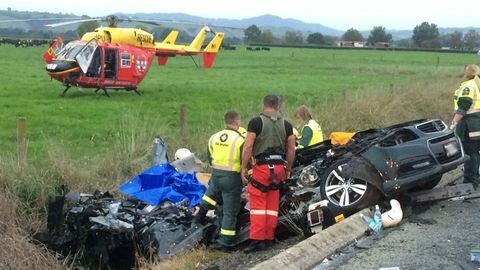 The pair were airlifted to Waikato Hospital both in a critical condition, Waikato police Senior Sergeant Gill Meadows said. “The impact of the crash was so intense that witnesses noticed the truck and trailer unit get airborne on impact before shunting the car about 20m down the road into a fence,” said a report. They were just visiting: Female tourist had no chance! New Zealand fails another three foreign tourists, their family and friends! The logging truck slammed into a car full of foreign tourists right before me, said an eye witness on Monday morning. One female tourist in a grey Hyundai i30 was killed instantly and two others were critically injured in the 9.30am crash on State Highway 29 at the turnoff to Hobbiton, said a report. Taking a photo in New Zealand could cost your life! Darryl Richard Kitto, 47, [believed to be a foreigner] fell from a spot popular with sightseers overlooking the Rakaia Gorge, Canterbury , while trying posing for a photo. On Friday, US tourist, Richard Philip Hyde from Massachusetts, was killed by a reversing bus near Queenstown, while taking a photo. RIP. Melanie Floyd died in hospital on Saturday night after suffering critical head injuries four days earlier. A 68-year-old man died last night in Otakou, despite a helicopter being sent to what St John ambulance said was a medical emergency. St John call centre team leader Andy Gray said the helicopter assisted ambulance staff, but the man had subsequently died. Road worker seriously injured by car fleeing police. He was only controlling the traffic, Mr sh*thead policeman. A road worker controlling traffic has been seriously [near fatally] injured by a car fleeing police in Stokes Valley, Wellington. Why wasn’t this woman deported? An Indian woman who tried to smuggle cow urine into New Zealand last year was fined just $400 for not declaring it. “The World Health Organization (WHO) is pressing Asian countries to cut their road death and injury toll in half by 2020. 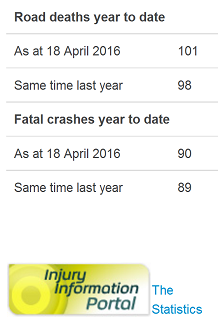 According to our calculations the road toll in those countries is about 17 fatalities per 100,000 of population. 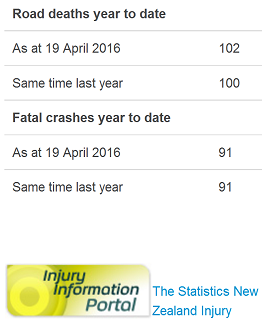 If the police didn’t manipulate the road toll in this country, you’d find the annual road deaths of about 900 translates into 20 fatalities per 100,000 of NZ population.